Equipped with an HD multi-formatted camera system for filming, HD Studio enables users to produce a wide range of contents such as TV programs, digital cinema, and commercials. Blue and green chroma key curtains placed on the horizont wall of HD Studio makes for easy synthetic shooting. Users can also save costs by bringing in their own shooting equipment and paying only for the studio space. 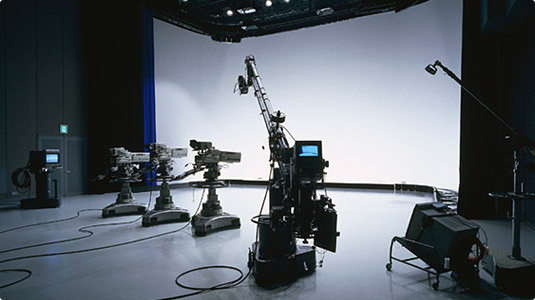 The camera system consists of 3 HD studio cameras and 1 HD handy camera. 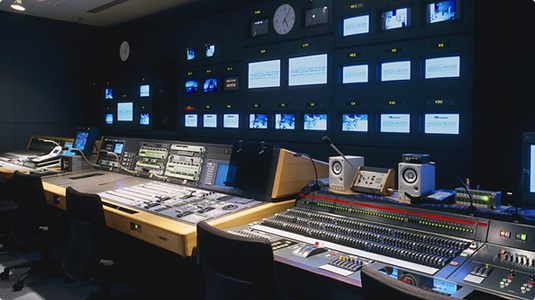 The cameras are digitally connected with peripheral equipment such as a full digital switcher, an HD-VTR, and an HD-telop, so that users can produce a variety of high quality HD programs. HD Studio’s multiple input system is equipped with an HD-CAM、an XD-CAM、an HD-D5、and an HDV, and is compatible with user-brought shooting equipment. Older SD materials can be converted to HDTV by HD Studio’s up-converter. The digital audio mixer equipped in HD Studio enables high quality sound recording. Other types of sound equipment available include wireless microphones, sound reproduction equipment such as a CD player, an MD player with auto-search function, various types of digital effectors, and TEL Remote to record sounds transmitted via telephone lines. A PA system, which is essential for public music programs, is also available for use. The HD Studio is attached to very comfortable and user-friendly staff and performer waiting rooms. Each room is designed and equipped to ensure a comfortable and easy working environment. For example, users can monitor recording processes using an operation support camera and use the internet by connecting their laptops to the LAN terminal. With a digital sound processor and a multi-speaker system that are always available for users, the audio equipment in the HD Studio can be compatible with various kinds of Dolby formats. Since the HD Studio is linked with the 5.1ch MA room online, the HD Studio can be used as a theater-sized MA room. Each studio is designed and equipped at users’ convenience. For example, a staff room and a waiting room for performers are easily accessible and very comfortable to use. Moreover, Users can check progress of shooting in every studio with an operation support camera or VTR. * Please enquire about HDCAM-SR, XDCAM-HD, DVCPRO-HD and HDV.